Observed at Kitale, Kenya, April 2013. The wasp is about 15 mm long. From Wikipedia: A tarantula hawk is a spider wasp which hunts tarantulas as food for its larvae. Tarantula hawks belong to any of the many species in the genera Pepsis and Hemipepsis in the family Pompilidae (spider wasps). The more familiar species are up to 5 cm (2 in) long, with blue-black bodies and bright, rust-colored wings (other species have black wings with blue highlights), making them among the largest of wasps. The coloring on their wings warns potential predators that they are dangerous (aposematism). Their long legs have hooked claws for grappling with their victims. 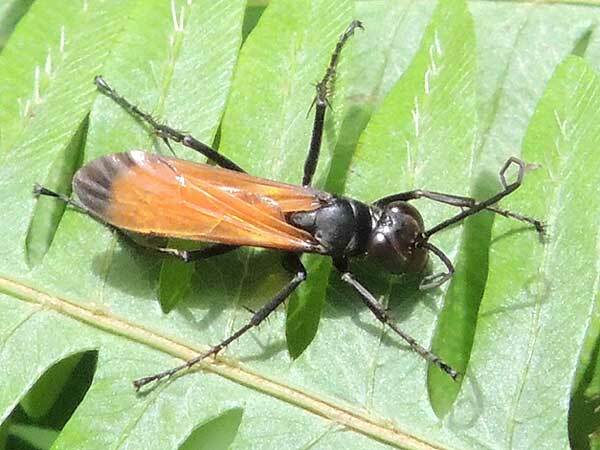 The stinger of a female tarantula hawk can be up to 7 mm (1/3 in) long, and the sting is considered the second most painful insect sting in the world.